Address: 9400, Sopron Templom utca 2. The first book published on the science on mining was written by Georgius Agricola in the 16th century. 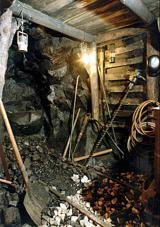 It is still the most important source when examining the mining of the period. A miner officer training school started working in Selmecbánya following the order of Charles III in 1735. The manager was Sámuel Mikoviny. The school period lasted two years. The school was given the Collage status by Mary Teresa which lead to the foundation of the Acadamy of Mining where studies of miner and smelter architect could be pursued. The Associating of the Mining Towns of Lower Hungary was founded in 1380, the same association in Upper Hungary was founded in 1487. Their characteristic feature was the so called mine coin, which were accepted only in the town of their deflation. The Carpathian Basin is known as an area rich in special minerals. Out of its solid mineral row materials the most known are as follows: copper, silver, ore, lead, zinc, iron ore, a bauxite, manganese, uranium, rock salt and coal. From the second half of the 19th century the most important material to mine was the coal. From the end of the 1950’s trapeze shaped drifts were built, which were lit by so called turbo lamps. Railway and iron wagon helped in moving the coal. Because of the accidents a rescue process was developed from the second half of the 19th century. One of its important tools was the Westfalia type equipment made at the beginning of the 20th century. The first thematic group of the material of our exhibition include the representation of the art of miners. Sándor Gáspár, painter was the artist representing mining topics of the last decades. His large sized artwork titled 'The Exploration of the Coal of Dorog' is the first painting the visitors meet when entering the museum. It is the opening picture of the series of pictures introducing the history of mining in Dorog. The development of mine construction is demonstrated by mockups at the exhibition. 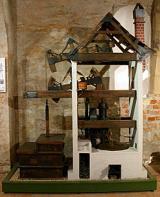 The pedalling wheel used from the 15th century resulted the concentration of human power. In other words it is an endless leather, the climbing of which the vitlások pulled up the gained materials from the mine through their own weight. The movie theatre in the museum, which functions in a video system selects from the newsreels of the last 50 years from the topics of mining, prevention of accidents at a professional showing. Our museum offers digital medal collection, digital substance catalogue, with which we virtually "opened" our stores. We also offer interactive guided with the help of historic energy recovery models.